Jacqueline du Pre was such a talented musician. Multiple sclerosis took her from us at what could have been the height of her musical career. MS is the number one condition that disables young adults. What a loss we all share. Here is her story. Jacqueline du Pre - child prodigy? Jacqueline is said to have heard the cello on a radio show at the age of four. She then asked her mother for "one of those". Now if you are a mother as I am, what would you have done? Well her parents did get her "one of those". The music world is grateful to this day for the indulgence of those insightful parents. They apparently saw something in their little girl. I must admit that we have one of those little girls. Like Jacqueline du Pre, we saw something in our youngest daughter at a very young age. She is now 14 and a self-taught artist. She's been drawing since she could hold a pencil. So... thank you, Mr. and Mrs. du Pre, for believing in Jacqueline. Jacqueline's mother taught her till age five, when Jacqueline began studying at the London Violoncello School. From age 10 to 16, she studied under William Pleeth, a famed cellist who complimented her as being better than him. At age 16 she made her first formal debut in London at Wigmore Hall. 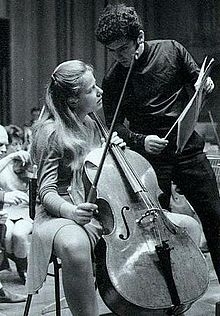 She performed her first concerto, the Elgar Cello Concerto in 1962. This was the concerto which she is best known for. Jacqueline went on to play the cello in many performances. In 1971, she began experiencing numbness in her fingers and other parts of her body. This she finally found out, was due to multiple sclerosis. 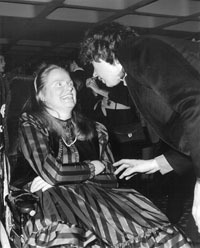 She was diagnosed with MS in October of 1973. She performed only a few more times, because of the effects MS had on her health. She died in 1987 at the age of 42. She leaves behind a legacy of beauty in the form of her recorded music. I have always loved the cello. It's deep, rich sound is one of the most wonderful instruments ever made. It touches deep within the soul. I loved when Cir would play for me. He was still learning, but I didn't care. Cir hasn't played for years, but the sounds have always stayed with me. Jacqueline du Pre made our lives richer with her musical contribution, in spite of her MS. The effects of MS can be mild or severe. The lives it touches can be stopped in their tracks or just made a little more difficult. I'm sure that many who loved Jacqueline wished that her MS would not have taken such a wonderful musician from us at such an early age. You can also go from Jacqueline du Pre to read Interviews of other MSers like you.